With Michigan being on a bye-week, the coaching staff hit the recruiting trail to offer multiple 2016 recruits and one 2017 recruit. Who was on the receiving end of these offers? Michigan will be getting a visit from a 2015 target next week. Who is it? Find out in this Fridays version of "The Future Huddle." On Tuesday, Michigan extended a scholarship offer towards 2017 Defensive End Corey Malone-Hatcher. Although it’s early to be talking about 2017 recruits, Corey jumps off the screen when watching his highlight film. He is extremely talented for only being a sophomore in high school, and will likely turn into one of the best players in the 2017 recruiting cycle. Frankly I’m surprised it took this long for the coaching staff to offer him after seeing rival Ohio State offer him in July. Playing for his St. Joseph High (Saint Joseph, MI) team, Corey is an absolute beast on the defensive line. He’s constantly breaking through the offensive line and putting pressure on the quarterback, which results mostly in him getting a sack, or the quarterback throwing the ball away. Weighing 235 pounds, Corey won’t need to add much to his 6 foot 3 frame in his remaining two years of high school football. He’s a decent tackler but needs to practice on wrapping up a little more. Don’t get me wrong, he’s definitely a hard hitter, but at the next level players might be able to escape unless he starts wrapping the ball carrier up. He has a great burst off the line of scrimmage and does an excellent job of breaking containment from the offensive lineman. There is no better word to describe Corey's game other than "play-maker." Corey also plays some linebacker but Michigan has offered him strictly as a defensive end. Wherever Corey ends up playing his collegiate career, he is going to be a dominating force. Corey is ranked as the #4 defensive end and #108 overall according to 24/7 sports. 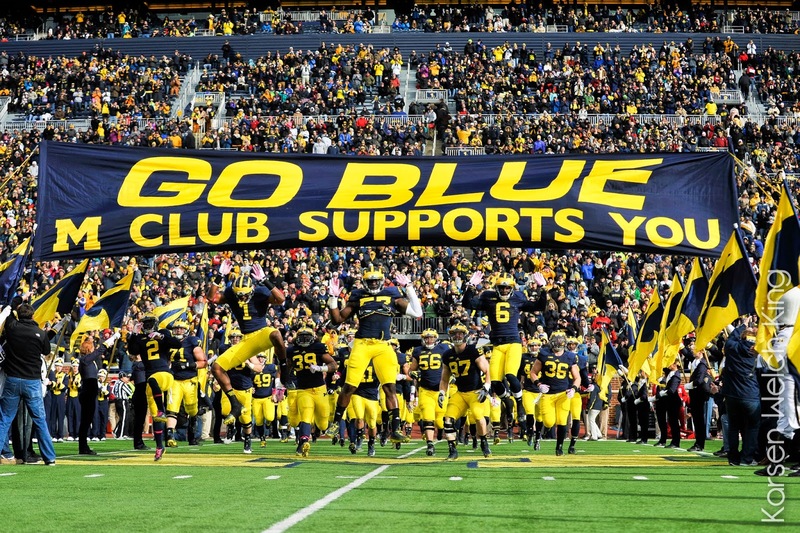 Michigan joins Ohio State, and Penn State as the only schools to offer a scholarship. On Thursday night, Michigan extended an offer to 2016 cornerback Damar Hamlin. Damar is an extremely talented cornerback out of Pittsburgh. He has the ideal height and weight (6-1, 170 lbs) to be a high quality defensive back at the next level. In my mind, Damar is extremely underrated. There aren't many flaws in his game, and Damar always seems to be in the right place at the right time. Damar is able to keep up with almost any receiver on the field due to the excellent speed he possesses. He gets to the ball quicker than any other defensive player on the field, and is utilized almost to perfection by his high school coach. Damar is able to play man-to-man coverage, zone coverage, and is even capable of getting into the backfield on blitzes. He has a very high football IQ and is constantly making plays on the ball. Although Damar is currently viewed as a Penn State “lean”, if Michigan is able to land the talented 4* prospect, he could do damage in the Wolverines secondary for years to come. Hamlin currently holds scholarship offers from the likes of; Penn State, Notre Dame, Ohio State, and Virginia Tech. He is currently ranked as the #15 cornerback, and #180 overall according to 24/7. Also on Thursday, Michigan offered 2016 offensive guard Terrance Davis. There’s not many times watching an offensive lineman on film can be entertaining, but Terrance is an exception. Standing at 6’4 and weighing 310 pounds, Terrance is an absolute monster controlling the line of scrimmage. Terrance is extremely quick for someone his size, and his highlight tape shows it. He has a great burst off the line, and does an excellent job of staying with his man until the play is dead. He does a great job of using his arms to keep pass-rushers in front of him. Not only is he capable of defending the pass-rush, he is also able to break off the line and set up blocks further up field. In my opinion, Terrance has all the tools to become a great college football player wherever he decides to enroll at. Come signing day 2016, I fully expect Terrance to have a major bump in his rankings. "I like what the previous players there have built and they also offer an awesome education as well. That great education is something I'm looking for. I want to go to a place that creates connections for me after football as well and to play for a school that can prepare me for the next level." Terrance has a short, but very respectable offer list including; Alabama, Georgia, South Carolina, Kentucky, Tennessee and Florida State. He is ranked as the #2 offensive guard and #155 overall according to Rivals. On Thursday morning Coach Mallory stopped into Gilman Prep school (Baltimore, MD) to check out a pair of 2016 offensive lineman. First up, Coach Mallory extended a scholarship offer to Devery Hamilton. Devery is a very intriguing prospect. He plays both offensive tackle and strong-side defensive end for his Gilman Prep school. Playing on the offensive side of the ball, he has a solid burst off the line and constantly attacks defenders. In my opinion, with Devery’s skillset, he is better suited off in a run first offense, as he is able to shed defenders and get up field to set blocks. He does an excellent job of running through his block, while keeping his feet moving. Watching his highlight film, it’s almost unfair to watch him push linebackers/defensive backs ten yards back. He has excellent laterall movement, making it extremely difficult for pass-rushers to get by him. On the defensive side of the ball, Devery does a good job of shedding blocks and getting into the backfield. For weighing 270 pounds, Devery does have some good speed, making him able to get to the quarterback/ball carrier much quicker than I initially thought. Most of the time that Devery gets into the backfield; it’s from hitting gaps in the offensive line. At times, Devery needs to use his hands more often to move the offensive line. He does an excellent job of wrapping up his man and bringing them to the ground. At this point in his recruitment, it’s hard to tell if he will play on the offensive or defensive side of the ball during his collegiate career. But, that’s not exactly a bad problem to have. Devery has a short, but impressive offer list including; Michigan State, Clemson, LSU, South Carolina and Maryland. He is currently ranked as the #21 offensive tackle and #235 overall according to 24/7. While still at Gilman Prep, Coach Mallory also extended a scholarship to 2016 offensive lineman Stephen Spanellis. Spanellis has the ideal size (6'5, 295 lbs) to play tackle at the college level. During his time at Gilman Prep, he has seen playing time at all five positions on the offensive line. Anytime you can recruit a kid who plays all the positions that Stephen can, it provides necessary depth for every position. Like Hamilton, Stephen gets a good jump off the line and pushes his opposition down-field. For playing a tackle position, Stephen is able to get off the line of scrimmage, move past his defender, and get down-field to set up blocks either for the running or passing game. However, in pass-rush scenarios, I do like Spanellis a lot more than Devery. He's able to cover a lot more ground with his lateral movement, and after watching his highlight film, it looks like Stephen is more comfortable in these situations. He does an excellent job of using his big frame to gain leverage on defenders trying to break the line of scrimmage. Stephen does a lot of things right on the football field, and in my mind he is very underrated. I don't mean any knocks on Devery Hamilton, but I feel like Stephen is more of a complete package for an offensive lineman. Stephen holds a short offer list featuring; Michigan State, South Carolina, Maryland and Georgia Tech. He is currently ranked as the #23 offensive tackle according to Rivals. On Thursday, the Wolverine coaching staff also extended a scholarship offer towards current Florida State commit Josh Brown. Brown is an extremely talented defender and has seen playing time at both defensive end and linebacker this season. He has all the tools to become a force at the next level. He has the ideal size/speed/IQ and athleticism to be All-American once he goes to college. Josh does an excellent job of shedding blocks and putting pressure on the quarterback. Once he’s in the backfield, Josh does a great job of wrapping up the ball carrier or bringing them to the ground. I’m not going to write too in-depth about Josh because at this point he looks very solid with his commitment to Florida State. Unfortunately, at this moment I do not see the Wolverines being able to flip the 4* prospects commitment. Josh is currently ranked as the #4 WDE, and #71 overall in 2016 according to 24/7. 2016 QB Malik Henry committed to Florida State on Thursday afternoon. Malik held a scholarship offer from the Wolverines, and was even on campus as recent as last June. 2015 Wide Receiver target and current Florida State commit Auden Tate will be in Ann Arbor next weekend for an official visit. Coach Ferrigno stopped in to visit 2015 5* DB Iman Marshall and 3* DB Colin Samuel this week. 2015 DE/OLB target Keisean Lucier-South received his Army All American jersey on Wednesday. Keisean is likely to make his college decision between Michigan, Oregon, UCLA, and Oklahoma.